We've been selling role playing games for 11 years now. About 75% of what we sell is D&D and Pathfinder with the other 25% being the top dozen game systems and a smattering of indie games. Just a smattering. I think we're fairly normative when it comes to RPG stock. We're not an RPG powerhouse, but we do sell an above average amount for an "alpha" store. Take that with a grain of salt. We have had 4,005 titles in stock over the years. We currently have 498 titles. If you've been working feverishly on that RPG for years until it's perfect, know we've already dumped 88% of everything that has come our way. It comes in. We sell it. The market is saturated. We dump it and move on. Just put out your book already. We spent thousands of dollars professionally developing an RPG adventure for our Kickstarter capaign. You can buy it on the Paizo website right now. We've sold 15 copies since March. It's pretty much tapped out now. Moving on. A successful product in the game trade reaches and maintains a turn rate of three or more per year. That means, in a year, we sell three or more copies. More accurately, we divide the sales by the number of copies on the shelf. Usually that's one copy, but in the case of a very popular book, it can be 3-8 copies. We'll get to that at the end. The 3,507 RPG titles we no longer carry couldn't maintain that "3" sell through rate. That's just a fact of retail life. If you've ever wondered why a Wal-Mart or a Target doesn't carry RPGs or at least more than a reasonable selection, it's because they need eight or more turns on each product. Less than 10% of our titles achieve that. 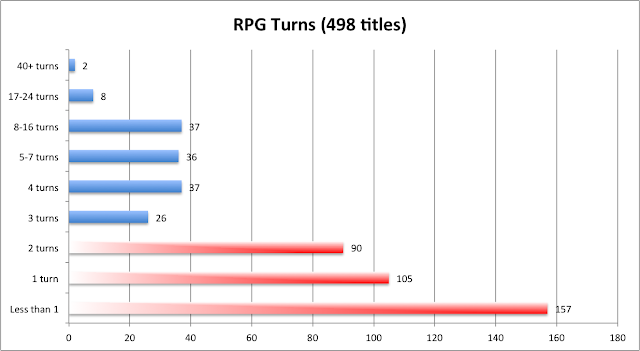 352 titles, or 71% of our RPGs, sell less than 3 turns a year. The vast majority of RPG products under perform. You might wonder why we bother carrying them with such poor performance metrics. The reason is the top 29% round out the numbers, bringing the overall total to an acceptable level, usually around 3 turns total. You can't just carry the top 29% and expect to accomplish this, and you can't even sell those without a lot of specialized knowledge, organized play and hand selling. That's why game stores exist, to provide those services to make the unworkable majority of RPGs workable. If this sounds like a lot of work, it is, and it's why many new stores don't even bother carrying RPGs. We love them, so we do the work. 88% of RPGs get cycled pretty quickly. 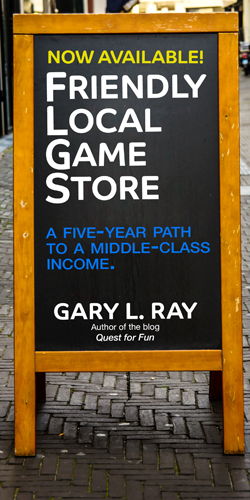 Many game stores are abandoning this model because there are more profitable ways to make a living. Alright, so 11 titles because I wanted to show off Goodman Game's D&D 5e adventure, Fey Sister's Fate. You'll notice no D&D 5 Player's Handbook. That's because we're talking turns and having to stock deeply on this title (8 in stock at all times) means it has a turn rate of only 10. Wizards of the Coast has created a bit of anxiety with the D&D 5 release and early shortages mean we stock deeper which hurts our performance. The 5E Player's Handbook is actually the best selling RPG title in the store (119 copies sold in the last year). The Pathfinder Core Rulebook used to be number one and it's now number fifteen. It once sold as many as 90 copies a year, but sold a sad 18 copies over the previous 12 months.